In What Great Service Leaders Know & Do, James L. Heskett, W. Earl Sasser Jr., and Leonard A. Schlesinger leverage their extensive research and personal experience at the forefront of the service industry to pinpoint what makes standout service firms like Southwest Airlines and IKEA so successful. The book takes an analytical approach but keeps the human element at its core, recognizing that success in service begins and ends with front-line employees. The goal of any business is to provide the highest value at the lowest cost. Service companies need to remember to deliver value to not only their customers but also their employees and their investors in order to remain profitable. Companies need to have a clear understanding of their target markets. Just as they must know who they are selling to, service leaders need to understand who they are notselling to. All marketing strategies and subsequent support systems should be developed with the target market in mind. Most businesses rated as the “best places to work” also rate highest in customer satisfaction. Customer engagement is dependent on employee engagement. Employees are more important to service companies than to any other kind of business. Employees must be hired carefully based on their attitudes, trained effectively to become knowledgeable in their roles, and provided with a support system that keeps them engaged. Technology makes up a powerful and effective component of a support system, but care must be given to prevent employees from relying on it to do their jobs for them. Technology should make employees more efficient and effective. The level of appropriate technology is highly dependent on the type of service business in question. Customer ownership is about making customers feel as though they have a stake in the company. Customers feel a sense of pride in participating with companies, and studies have shown that the loyal minority of repeat customers are worth far more than first-time customers. I myself have been a devoted Netflix member for over 4 years. I was thoroughly excited at the prospect of their instant streaming service, and their ability to continue their great customer relations and low prices. Unfortunately, I do feel that the recent chain of events and consistent lack of dialogue with their customers has shown little respect for the immense member base that has led to their tremendous success. I only learned of their sudden price increase due to my credit card bill showing that my Netflix charge had almost doubled. Moreover, there was no response to this price increase for almost an entire month. The mass generated e-mail is a gesture in the right direction, I suppose. Netflix’s actions have gone against even the most basic rule of customer relations: the customer comes first. I wonder now how important customers truly are to the company’s overall vision, and how many the past few months of conduct will cost them. What do you think about Netflix’s recent split? 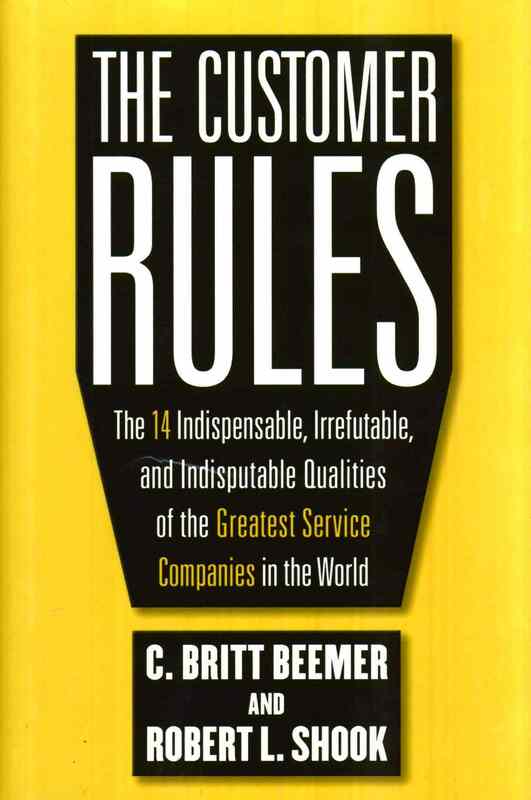 C. Britt Beemer and Robert L. Shook’s The Customer Rules presents the argument that the world’s most successful companies are those with an unwavering commitment to customer satisfaction. According to a study conducted by America’s Research Group (ARG), 40 percent of employees feel their job has little or nothing to do with a customer. Successful companies, however, make it clear that customer satisfaction is everyone’s job. One way to do this is to make customer satisfaction part of all employees’ job description. Unless the concept is clearly spelled out, most employees will assume that serving the customer is the job of sales and marketing.